If you were put on the spot in front of a hundred people with no rehearsed script, would you be able to crack a joke? That is exactly what the Saint Joseph’s University Improv Team does. When the team performs, they ask audience members to yell out any word or topic and right there on the spot, the team creates an entire skit based on that word. 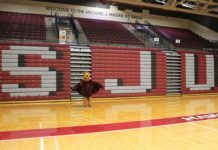 We sat down with some members of the team to get a behind the scenes scoop on the Improv Club at Saint Joseph’s University. 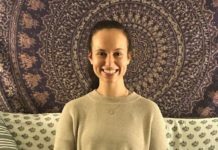 Sophomore Siobhan Naughton gave us some insight on what improv comedy really is. 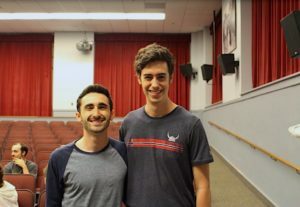 We asked senior Alex Ventola and Chris Kenkelen about their experiences on the Improv Team over the past couple of years. Naughton also shared her experience with improv and told us why she decided to try out for the team. Interested in joining the Improv Club? Check out their Facebook page and reach out to learn more about auditions and upcoming shows! If you think you’re a funny person and can come up with jokes on the spot, The Improv Club might be for you! 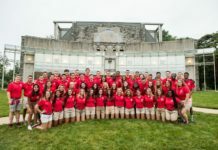 Check out HawkcHill to learn more about them!